Shooting A BOW AND aRROW! Shooting a bow and arrow can be a real challenge if you are a beginner to archery. We have tried to provide you with a lost cost bow that will give you a chance to learn how to shoot an arrow straight. This page is dedicated to making an all out effort to help you hit the bullseye, or maybe we should start with the tree trunk. I remember when I made my first bow, that worked, how hard it was to get the arrow to go where I thought I was aiming. Honestly, it took a while before I actually figure out how to shoot a bow and arrow. I was so happy the first time I actually hit the box. The video below is a video of me shooting one of my bows. Remember it took a while before I could hit the target. The key and secret to shooting a bow and arrow is in the title. It takes a little coordination of the bow and the arrow. It takes an understanding of the bow and and arrow. First, most of the bow I sell I place and arrow rest and guide. On the Full Length Bows, like the Black Lighting Bow I don't put an arrow guide, Most long bows do not have an arrow guide. You can put one on it but you normally shoot a long bow off the knuckle. The arrows I send are designed to be shot with the single colored feather or vane pointing to the left, outward allowing the two same colored feathers to go smoothly through the guide. NOTE: IF YOU HAVE A TAKE DOWN BOW MAKE SURE THE BOW IS STRAIGHT. If it is not straight the guide is going to out of place. If the bow is placed together straight the arrow guide should be on the left side of the bow and the arrow should slide right through the guide with no problem. I am going to place a few vidoes on shooting a bow for you to watch. The following video will explain and show you how the feathers/fletchs should go. It is simple video but it will show beginners how to shoot. Hopefully that helped a little. If you are having problems please give me a call. 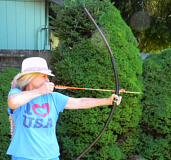 I am going to include a few more videos on how to shoot a bow and arrow. I hope this has helped. The key to getting good at shooting a bow and arrow is to practice. After practicing practice some more. If you are having a problem with the arrow not going straight after watching these videos and reading the instruction please give me a call or write. To determine which link you need for your bow just look on the invoice to see if you have a Take Down , Full Length or a Light Bow. After determining wwhich one you have click on the link for instructions and a few videos.